One of the irritating tasks I am required by law to perform for the government is fill in a bunch of detailed information about my business for the US Census Bureau. This is one of a number of reports the government sends me each year to fill in. The first thing I look at on these forms is whether they are required by law. If they are not, they immediately go in the trash can. In particular, I could spend 110% of my free time filling in Department of Labor surveys that seem to come for each state we operate in. The only entertainment value I get associated with these many surveys is the calls I sometimes get from government workers asking me if I would please fill in the survey. Generally I explain to them that 1. My time is too valuable to waste on this stuff and 2. There is no way in hell I am going to give them a bunch of data they will likely only use to justify new regulations that make my business life even harder. Perhaps I am a failure as a business person, but my company does not track expenses in this detail, or at least in these specific categories. The exercise was not only absurdly time-consuming, it was impossible. Depending on my mood, I might have just filled it all in with random guesses. However, even though it is not supposed to be used this way, I couldn't shake the sense that someone someday might try to use it to compare against my tax returns (which are prepared quite carefully and accurately) and try to raise red flags. So I left it all blank. I will be interested to see how they respond. 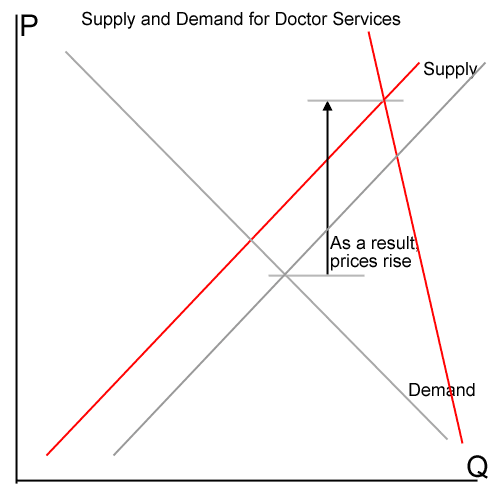 A Global Economy in Health Care Services? Good! I am confused by your using the word "flee". If I buy a Toyota, no one says I am "fleeing" the US manufacturing system. It is a global economy, and I don't know why the globalization of health care services is anything but a good thing. 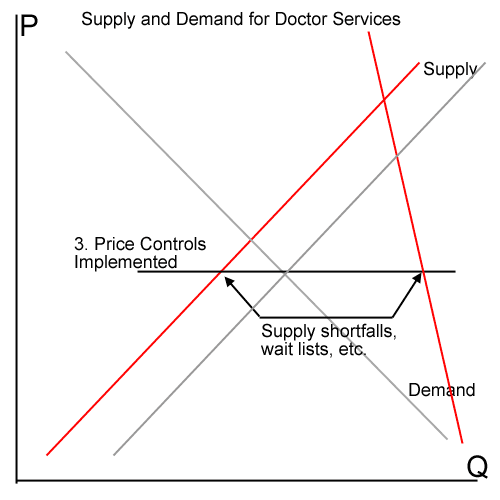 We have put so many barriers in the way of expanding capacity (licensing, certificates of need, FDA approvals, etc) and legislated so many artificial monopolies in health care, it seems perfectly reasonable, even good news, that competition for medical services is emerging from other countries. Last night, the accumulated years of being called an evil-Koch-funded-anti-science-tobacco-lawyer-Holocaust-Denier finally caught up with me. I wrote something like 3000 words of indignation about climate alarmists corrupting the very definition of science by declaring their work “settled”, answering difficult scientific questions with the equivalent of voting, and telling everyone the way to be pro-science is to listen to self-designated authorities and shut up. I looked at the draft this morning and while I agreed with everything written, I decided not to publish a whiny ode of victimization. There are plenty of those floating around already. And then, out of the blue, I received an email from a stranger. Last year I had helped to sponsor a proposal to legalize gay marriage in Arizona. I was doing some outreach to folks in the libertarian community who had no problem with gay marriage (after all, they are libertarians) but were concerned that marriage licensing should not be a government activity at all and were therefore lukewarm about our proposition. I suppose I could have called them bigots, or homophobic, or in the pay of Big Hetero — but instead I gathered and presented data on the number of different laws, such as inheritance, where rights and privileges were tied to marriage. I argued that the government was already deeply involved with marriage, and fairness therefore demanded that more people have access to these rights and privileges. Just yesterday I had a reader send me an email that said, simply, “you changed my mind on gay marriage.” It made my day. If only climate discussion could work this way. So I decided the right way to drive change in the climate debate is not to rant about it but instead to continue to model what I consider good behavior — fact-based discussion and a recognition that reasonable people can disagree without that disagreement implying one or the other has evil intentions or is mean-spirited. This analysis was originally published about 8 years ago, and there is no longer an online version. So for fun, I thought I would reproduce my original thought experiment on climate models that led me to the climate dark side. I have been flattered over time that folks like Matt Ridley have picked up on bits and pieces of this analysis. See it all here. Is Occupational Licensing Meant to Block Competition from Ethnic Minorities? Looking at this map of state licensing regimes (darker is more onerous, with AZ being the worst), it is hard to correlate with states being Republican or Democrat. That doesn't surprise me, because I have always thought the urge to restrict competition and protect incumbents has always been a bipartisan enterprise. So I sat and thought for a minute about my home state of AZ. Why is it the worst? We have a pretty good libertarian history here, from Goldwater onwards. We have at least one fairly libertarian Senator (Jeff Flake). So what is the deal? My hypothesis is that it is related to immigration. The same majority Republican legislators who are generally open to free markets simultaneously have an incredible fear and loathing of immigration. Perhaps our onerous business licensing regime is driven by nativists wanting to protect themselves from competition by new immigrants, immigrants who would struggle to compete onerous licensing requirements? Hmm, we might be getting somewhere, but its not a perfect fit. So instead, let's hypothesize that business licensing is aimed at non-white, non-hispanic groups in general (similar to early justifications for the minimum wage as a way to keep black workers migrating from the south out of traditionally "white" jobs). 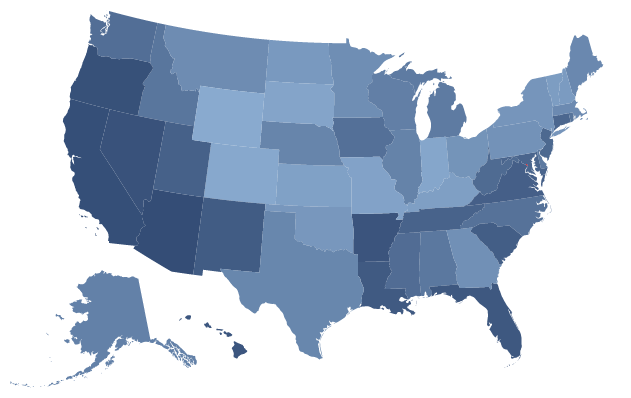 I cannot get it by state, but the map below by county looks pretty dang similar to the licensing map. 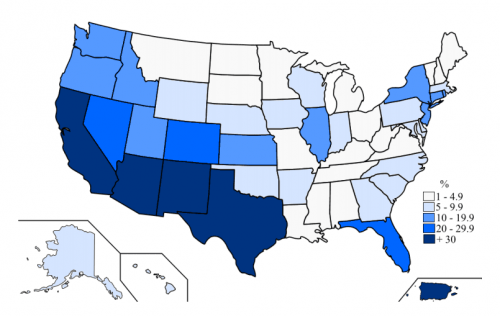 Areas in blue have above average percent of non-whites, red is below average. Not a perfect fit certainly (one would expect Texas to be more onerous), but perhaps close enough to treat the hypothesis seriously. I had always thought that I would be the last one to play the race card in a policy analysis, but business licensing tends to have an inherently base motive (protect one group from competition from another group) that is pretty easy to square with racial and ethnic fear. Faulting the IRS for attempting to “unilaterally expand its authority,” the D.C. Circuit today affirmed a district court decision tossing out the agency’s tax-preparer licensing program. Under the program, all paid tax-return preparers, hitherto unregulated, were required to pass a certification exam, pay annual fees to the agency, and complete 15 hours of continuing education each year. The licensing program was not only a classic example of corporate cronyism, but also of agency overreach. IRS relied on an 1884 statute empowering it to “regulate the practice of representatives or persons before [it].” Prior to 2011, IRS had never claimed that the statute gave it authority to regulate preparers. Indeed, in 2005, an IRS official testified that preparers fell outside of the law’s reach. Perhaps a first indication that the Obama Administration strategy to pack the DC Circuit with Obama appointees may not necessarily protect his executive overreach. PS - you gotta love the IJ. PPS - The IRS justified its actions under "an obscure 1884 statute governing the representatives of Civil War soldiers seeking compensation for dead horses"
@kdrum Missing the Point. 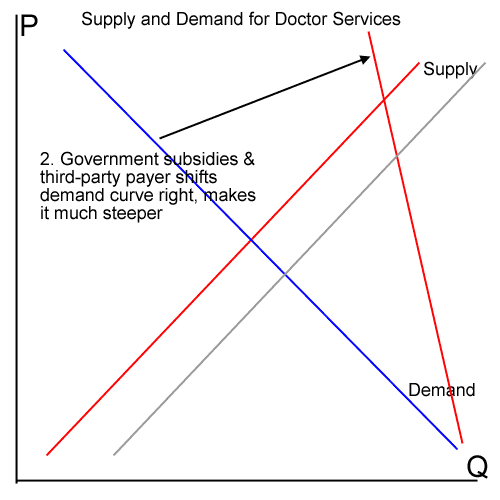 Doctors May Control the Cartel, but Government Gives it Power. The other day, Kevin Drum wrote a post wondering why we had so few doctors per capital in the United States and observing, reasonably, that this might be one reason to explain why physician compensation rates were higher here than in other countries. He and Matt Yglesisus argued that this smaller number of doctors and higher compensation rates were due to a physician-operated cartel. This is a proposition I and most libertarians would agree with. In fact I, and many others apparently, wrote to him saying yes there is a cartel, but ironically it owed its existence to government interventionism in the economy and health care. In a true free market, such a cartel would only have value so long as it added value to consumers. Drum seems to have missed the point. In this post, he reacts to themany commenters who said that government power was at the heart of the cartel by saying no, it's not the government because doctors control the nuts and bolts decisions of the cartel. Look! Doctors are in all the key positions in the key organizations that control the cartel! Well, no sh*t. Of course they are. Just as lawyers occupy all the key slots in the ABA. But neither the ABA nor these doctors cartels would have nearly the power that they have if it were not for government laws that give them that power (e.g. giving the ABA and AMA monopoly power over licensing and school credentialing). I had never heard of the RUC before, which apparently controls internship slots, but its ability to exercise this control seems pretty tied to the billions in government money of which it controls the distribution. Let's get out of medicine for a second. I am sure Best Buy wishes it had some mechanism to control new entrants into its business. Theoretically (and it may have even done this) it could form the Association of Bricks and Mortar Electronics Retailers (ABMER). It could even stake a position that it did not think consumers should shop at upstarts who are not ABMER members. Take that Amazon! Of course, without any particular value proposition to do so, consumers are likely to ignore the ABMER and go buy at Amazon.com anyway. Such cartel schemes are tried all the time, and generally fail (the one exception I wonder about is the Visa/Mastercard consortium, but that is for another post). Anyway, the only way the ABMER would really work is if some sort of government licensing law were passed that required anyone selling consumer electronics to be ABMER members. And my guess is that the ABMER might not invite Amazon.com to join. All of a sudden, Amazon is out of the electronics business. Or maybe it just gets forced to deliver all its product through Best Buy stores, for a fee of course. Crazy stupid, huh? The government would never write licensing laws to protect a small group of incumbent retailers, right? Well, tell that to Elon Musk. Tesla has been trying for years to bring its cars to consumers in innovative ways, but have time and again run up against state auto dealership laws that effectively force all cars to be sold through the state dealer cartel. Or you can talk to California wine growers, who have tried for years to sell directly to consumers in other states but get forced into selling through the state liquor wholesaler cartels. All these cartels are controlled and manned by the industry, but they are enforced -- they are given their teeth -- by the government. Certificate of need laws prevent hospitals from expanding or adding new equipment without government permission. The boards in this process are usually stacked with the most powerful local hospitals, who use the law to prevent competition and keep prices high. This is a great example where Drum could say that the decisions are essentially being made by hospitals. Yes they are, but they only have the power to do so because the government that grants them this licensing power over competitive capacity. Without this government backing, new hospitals would just laugh at them. 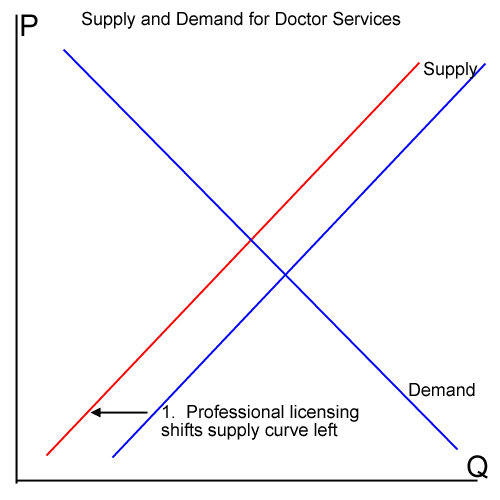 Government licensing laws let the AMA effectively write the criteria for licencing doctors, which are kept really stringent to keep the supply low. Even if I wanted to only put in stitches all day to busted up kids, I would still have to go through 8 years of medical school and residency. Drum and Yglesias focus on the the number of medical schools and residencies. I do not know if these are an issue or not. But what clearly is an issue is the fact that one has to endure 8 expensive years or more just to be able to hand out birth control or stitch up a skinned knee. Government licensing laws help doctors fight a constant rearguard action against nurse practitioners and other less expensively trained folks who could easily do half or more of what doctors do today. The FDA and prescription drug law not only helps pharma companies keep profits up, but also increases business to doctors as people have to have a prescription for certain drugs they could easily buy on their own (e.g birth control pills, antibiotics). The government limits immigration and thus labor mobility, reducing the ability of doctors from other countries to move here. There is no denying that in the middle of every industry cartel are insiders who are maneuvering to increase the rents of the incumbent players. In fact, I am sure that every industry has participants who dream about getting off the competitive treadmill and creating a nice industry cartel, and would be the first to sign up. But none of these dreams are ever going to happen unless they are enabled by the coercive power of government. Of course, the consistent answer is, well, we just have the wrong guys running things. If we had the right guys, it would work great. But this kind of co-option always happens. Look at taxis and liquor license holders and the entire banking sector. Five years ago I would bet that progressives thought they finally had that right guy in the administration. And look what has happened. Banking cronyism is as strong as ever. Obama's signature health legislation is full of crony giveaways. In 6 months the health insurers are going to be running the entire PPACA infrastructure to their own benefit. 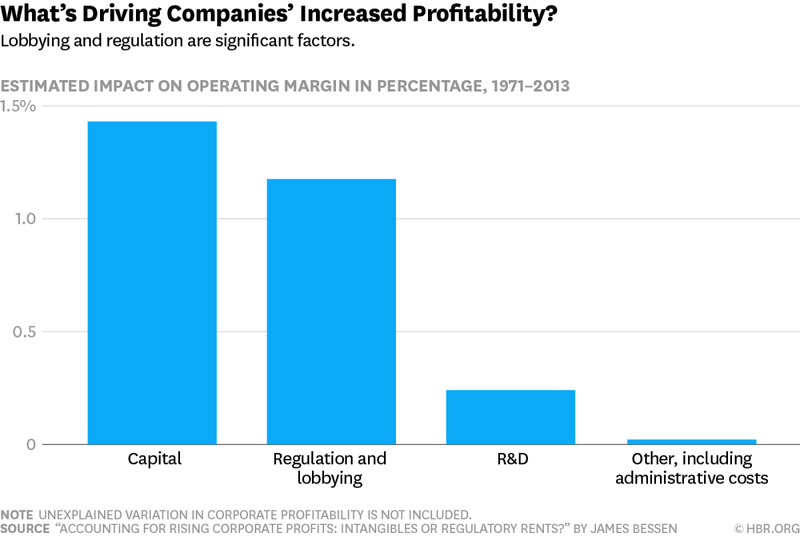 update: This post is verging on the "is cronyism capitalism's fault" argument. Rather than go into that again, it is here. Arkansas orthodontist Ben Burris was hauled in front of the state dental board in September after dentists in northeast Arkansas complained that he was offering dental cleanings to the general public in his Braces by Burris orthodontics clinics. The price for dental cleanings was $98 for an adult and $68 for a child, which Burris has said is about half of what dentists in northeast Arkansas typically charge. Burris said most of the patients who need cleanings donât have a dentist, but are checked by one of the three orthodontists in his clinic. Also, Burris said he offered the service because it was good for his business and good for the public. Some of his competitors âhave gone absolutely ballisticâ over the price and complained to the board, Burris said.